A number of werewolf sightings have been reported in woods outside of Hull, sparking locals to organise a a hunt for the beast on the next full moon. 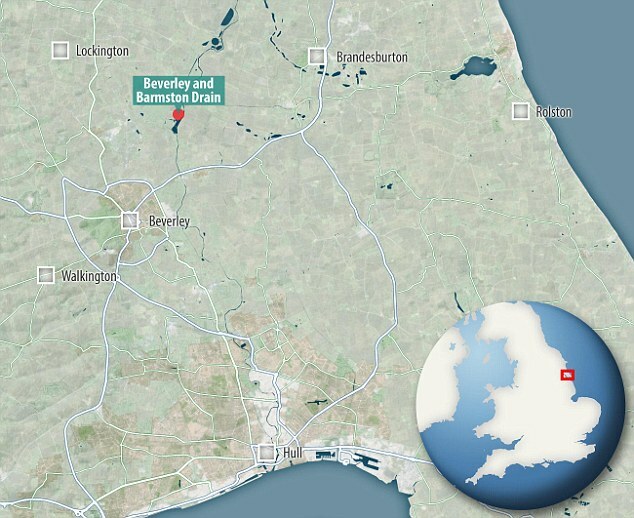 Over the past months, witnesses have come forward to speak of spotting a huge, hairy creature around the Barmston Drain, a man-made channel near the town of Beverley. Some locals believe the sightings are evidence of a mythical Yorkshire beast called ‘Old Stinker’. A woman who sighted the potential werewolf in December told the Express ‘It was stood upright one moment. The next it was down on all fours running like a dog. I was terrified. She said that it both ran on all two legs and on all fours, as if with the qualities of both human and wolf. Another couple said they saw something ‘tall and hairy’ eating a dog next to the channel, which runs through the countryside. They added that it jumped over an 8ft-high fence, with the animal in its mouth. Another woman who was walking her dog spotted something ‘half dog half human’, she told the Express. Her dog, she said, refused to go any further along the path they were walking down. 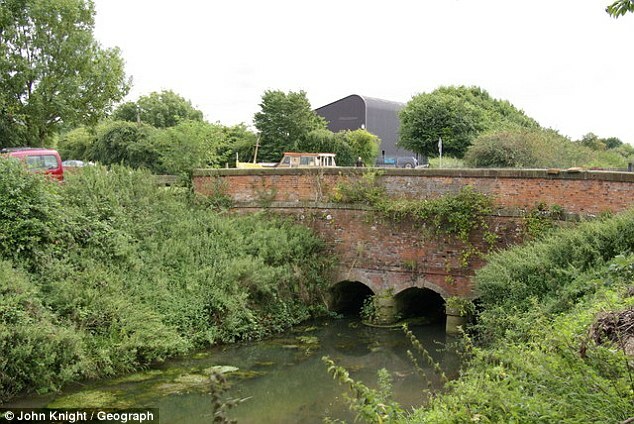 According to the newspaper, locals who believe something could be lurking around the banks of the Barmston Drain are going to go on a hunt on the night of the next full moon. They will be armed with cameras to prove their scary sightings were real. Local Labour councillor Steve Wilson has said he was willing to offer his services to the effort. Witnesses and folklore experts have been quick to link the sightings to the well-known legend of Old Stinker. Old Stinker is said to roam in the Yorkshire Wolds, an area of beautiful countryside north of the Barmston Drain. More specifically, the beast is supposed to stalk the Wold Newton Triangle, an area known for mysterious activity. For centuries, tales have circulated of zombies, ghosts, the Old Stinker werewolf and other paranormal activity. 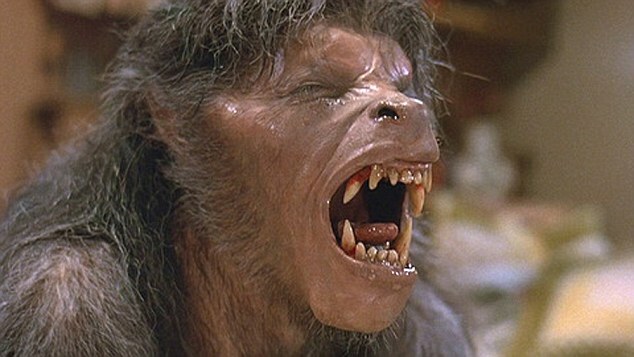 ‘There is the legend of a werewolf called Old Stinker – a great hairy beast with red eyes, who was so called because he had bad breath,’ author Charles Christian told the Hull Daily Mail. ‘It was known for the wolves to dig up the corpses from graveyards. From that sprung the idea that they are supernatural beings, who took the form of werewolves. But now, those well-versed in the paranormal fear that Old Stinker has outgrown his triangular haunt, and moved to the Barmston Drain. 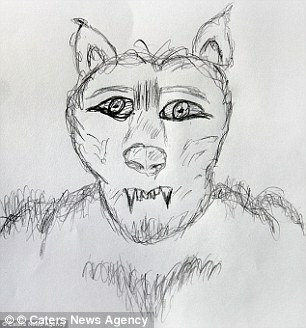 A terrified couple who claim to have came face-to-face with a black panther while driving through the English countryside have drawn a sketch of the blood-thirsty beast to warn the public what to look out for. 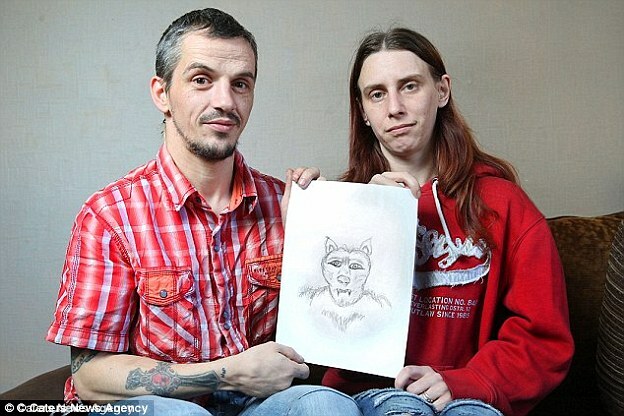 But the pencil drawing that Robert Ingram and wife Nicola have come up with is now likely to raise fears that what they encountered, rather than being a big cat, was in fact a werewolf. Their visual interpretation appears to show an animal with almost human like traits: big eyes, eyebrows, a long nose and full set of teeth. It also looks to hold its posture like a homosapien, far different from that of the feline they believe to have spotted. Robert’s black-and-white sketch does, however, emphasise that the animal the pair saw was covered in a hair or fur like coating, like a black panther. It does appear to have chest hair though, which again distances the bizarre creature from the big cat more commonly found in Asia and Africa then middle England. 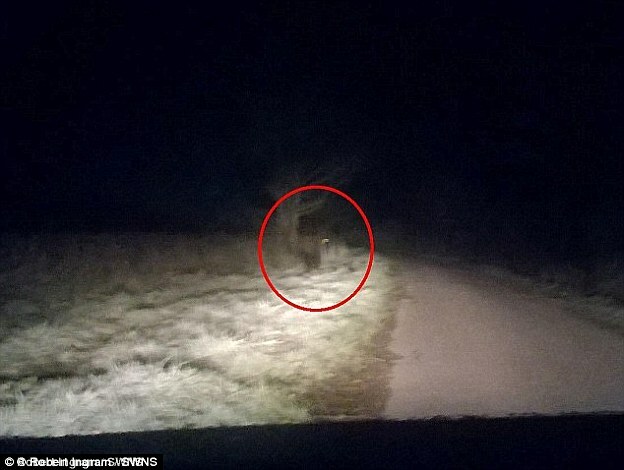 They claim the black outline – which they took a blurry photo of – was as tall as their car window, must have weighed around nine stone, and was ready to pounce at their vehicle before he put the foot down and they sped off. Although he and Nicola struggled to get a clear picture of the cat on camera, Robert has now produced the sketch in a bid to help cops and animal welfare officers find out what it is – and figure out how to catch it. The incident follows a sighting in Malvern earlier this month when a woman claimed an animal ‘bigger than a dog’ was ‘eating something fluffy’. Robert, a full-time father-of-three, said: ‘It was petrifying. It looked like it was on steroids. ‘We were driving along outside the national trust property, there are lots of open fields around there, when suddenly, I spotted something in the road ahead. ‘It was getting dark, but I saw its eyes reflect in my headlights. ‘We stopped the car, and it was just standing there. ‘We’d heard rumours about an escaped panther in the area, but we’d thought it was a load of nonsense. ‘But when I saw this animal with my own eyes, I was stunned. It was enormous, far too big for a fox or a dog. It must have weighed about 9 stone – about the same as a slim adult. ‘It looked right at us and walked up to the car. It then lowered the front of its body and looked like it was going to pounce. ‘Some of my mates have said they don’t believe me, but we came face to face with this thing. We know what we saw. Robert reckons that the beast may have escaped from a zoo. There have been dozens of claimed sightings of big cats in Worcestershire over the past few years.